I had extra credit card points and decided to put them to good use by getting vouchers for Tung Lok group of restaurants, as I have read that they serve good Chinese food. 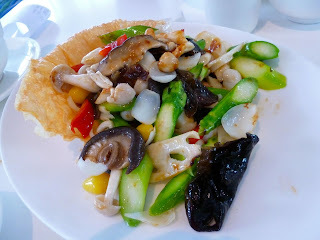 My husband and I used the vouchers for lunch at Tung Lok Signatures in VivoCity. For veggies, we ordered the The Eight Treasures (SGD 22.00). It's a dish with eight different ingredients -- black fungus, sliced lotus root, black mushrooms, gingko nuts, fresh lily bulbs, asparagus, honshimeiji mushrooms, and beancurd skin. I liked how the asparagus was very crunchy, and how the texture of the beancurd skin is reminiscent of pork skin. 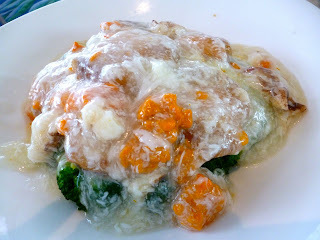 My husband and I were craving for scallops, so we had the Sautéed Scallops topped with Crabmeat and Roe (SGD 44.00). The scallops were deep fried with shrimp, and it had an egg-white sauce topped with crab roe/ fat (I could feel my cholesterol level rising several points after eating this!). Though the dish was very tasty, I felt the price was not exactly commensurate to the quality of the food. My husband and I were expecting much bigger scallops for the price we were paying for. 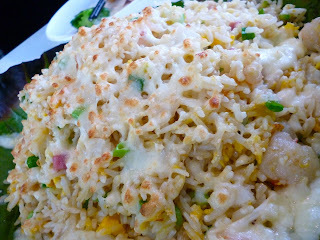 Lastly, we had the Baked Fried Rice with Seafood and Bacon served on Lotus Leaf (SGD 22.00). This was actually a full meal on its own. It had very generous servings of seafood such as crab, fish, and scallops. The serving size is quite big so we actually ended up taking home about half of the dish which we enjoyed for dinner that evening. Tung Lok Signatures serves good Chinese food indeed. However I found it a bit too expensive for the quality. I regret not ordering their lobster which was supposed to be their most popular dish. Perhaps I would have changed my mind on the price-value equation if I had a taste of their signature dish.